Matte Black Bathroom Accessories for UNDER $20! Matte black is all the rage and I’m totally into it! Check out where to find matte black accessories for UNDER $20 for your bathroom here. Another week, another One Room Challenge update. As I created the mood board for our powder room makeover I kept getting drawn to matte black fixtures and knew I wanted to incorporate them into our powder room. If you remember on week one of this makeover I mentioned we are on a tight budget, so we’ve had to get creative. A can of matte black spray paint has been my best friend. The towel bar and toilet paper, however, were not going to cut it so we decided to splurge and buy new ones so I went on a hunt for some budget-friendly accessories. *This post contains affiliate links. For more information see my disclosure here. Amazon and AllModern are the best places I’ve found. We went with #5 and #6 above for our bathroom and are using the soap dispenser from our master bathroom in our powder room now. One day hopefully in the next year or two we hope to give our master bathroom a major gut job, but in the meantime, I’m going to keep slowly stealing items from it in hopes my husband doesn’t notice. Update countertops — I can’t wait to show you what we did with these! Ready to see all the other rooms that are being transformed? Head to Calling it Home to see all the rooms being made over from floor to ceiling this season. Matte black bathroom accessories are really wonderful and gorgeous my opinion. I am really impressed looking these bathroom accessories. Especially I like your “Joey Soap Dispenser”. These accessories price rate is cheap. I am excited to want collect immediately. Thanks for sharing. I used in my bath Black Bathroom Accessories & always buy from CASA Bathrooware. 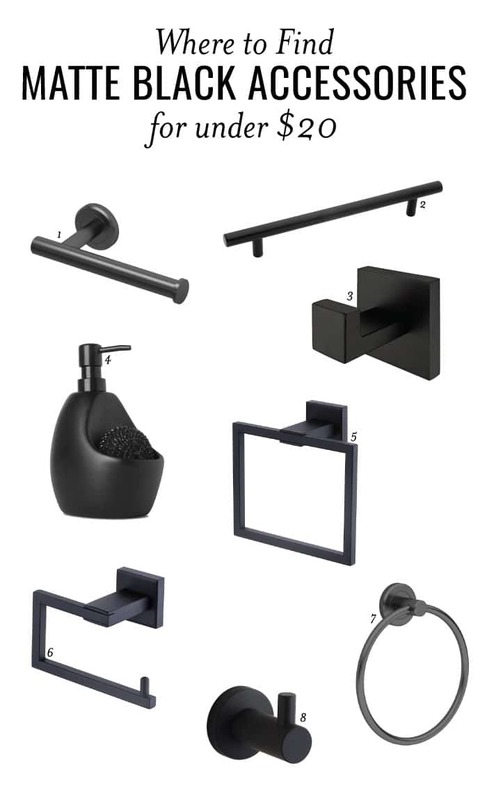 This is also a nice collection of Matte Black Bathroom Accessories. I will try also this.